Carlow Nationalist — Are you up for the Seán O’Brien challenge? » Are you up for the Seán O’Brien challenge? Are you up for the Seán O’Brien challenge? RATHWOOD near Tullow will be over-run by walkers, joggers and runners of all ages when the upcoming Seán O’Brien Seven Challenges takes place. This is only the second staging of the event after it attracted some 600 people last year and involves a 5km walk/run/jog through woodlands, plus several challenges to contend with along the way. Last year, Seán O’Brien, aka the Tullow Tank, was there presiding over the ‘gym’, an outdoor circuit course that involved participants testing their strength and fitness. Not only did Seán attract rugby fans, the event also appealed to fitness fanatics and families looking for a good day out. “We had 600 people here last year and that was the first time we organised it. This time, we reckon we’ll get about 1,000 people taking part. 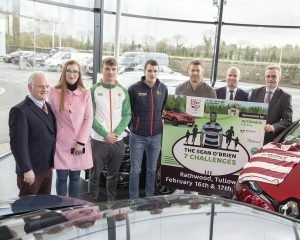 It’s a great event because you have the 5km taking place in a woods and then the challenges add a bit extra,” said Tullow Rugby Club president Noel Nolan. It’s a massive operation which takes in all of Rathwood and is sponsored by Rathwood Home and Garden Centre, and Auto Image. Up to 50 people are required as stewards and it takes two days to cater for all the entrants. It is pitched at anyone from eight to 80 years’ old and medals are given out to all who complete the course. The Seán O’Brien Seven Challenges takes place on Saturday and Sunday 16-17 February from 10am to 4pm. The entry fee is €10 per person if you book online, where time slots are allocated. Alternatively, it’s €12 each when registering on the day. Group discounts are available and proceeds from the event go to Tullow Rugby Club. You can also sign up on www.seanobrienchallenge.ie.